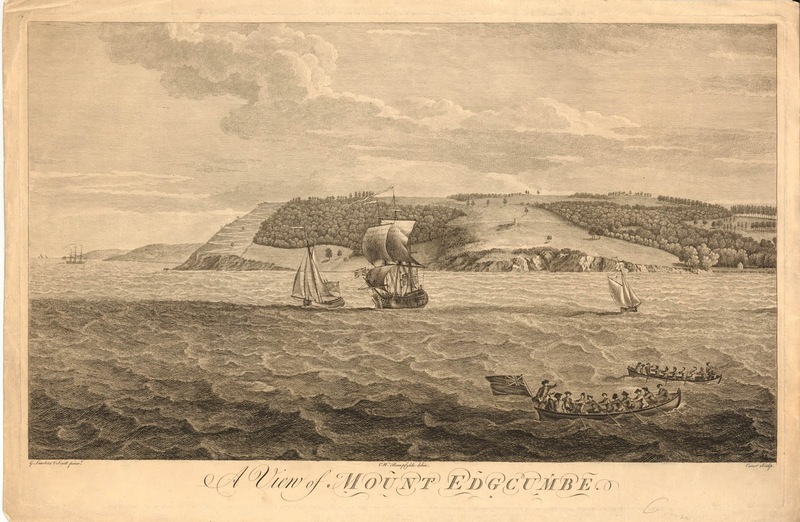 "View of Mount Edgcumbe," engraved by Pierre Charles Canot after Samuel Scott, 1755, British Museum. 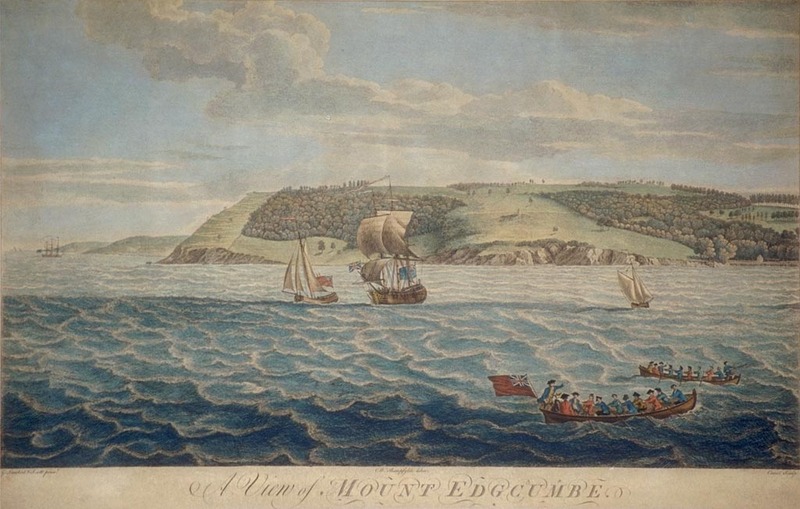 "View of Mount Edgcumbe," engraved by Pierre Charles Canot after Samuel Scott, 1755, Government Art Collection. This is another in the print series Five views of and from Mount Edgcumbe, Plymouth, in which engraver Pierre Charles Canot gives his impressions of the works of Samuel Scott. You can see the previous print that I examined here. Our only view of common tars comes from the two boats that pull for the right of the frame. In the foreground is a boat with a gesticulating coxswain and a fluttering red ensign, showing that these oarsmen are pulling against a strong headwind. In the background, a man stands in the bow of his vessel with a boathook extended. Presumably, both vessels are stretching out toward a larger vessel or a shore on which to land. In both boats, the men wear jackets with open slash cuffs that drop to about mid-thigh. At least one off the oarsmen wears his jacket without a waistcoat, though the cox in the foreground boat certainly wears a single breasted waistcoat. Several of the men are without hats, but most wear cocked hats. The cox wears his cocked hat reversed, but the rest of them wear their hats with the point forward.